The WINTER 2018-19 Issue is now online! in our trip through the alphabet for our cover themes. In these challenging times, we remember our need for courage, creativity, wisdom... and humour! to understand what is true and real. create and nurture the better world that we know is possible. websites), videos ~ and any other creative format you dream up! Are you getting the knowledge & insights you need in order to understand what is happening in the world today? Do you sometimes wonder if the mainstream media is giving you the whole (or true) story? Do you believe you have a right to hear what is really going on – in Ottawa, the provinces and globally – and how it affects (or will affect) all of us in our local communities? Do you ever wonder if the so-called 'opinion polls' actually reflect what ordinary people are thinking? Do you want to hear what Canadians and others are really thinking and saying? If you answered ‘YES’ to any of the above, then you will want to read Dialogue Magazine – on line and in print – the home of “Canada’s Independent Voices” since 1987! Read, write, have your say… in Canada’s unique, national, non-profit, volunteer-created magazine! 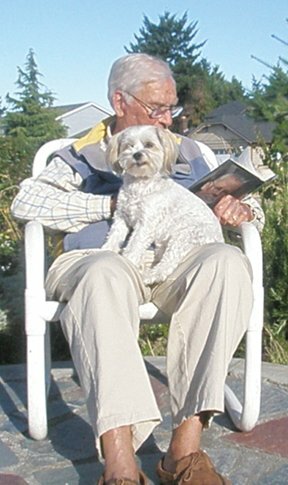 Penny enjoys the Springtime Sun while Dialogue publisher Maurice King enjoys a good book, on his patio in Nanaimo, on Vancouver Island, BC. is an independent, not-for-profit print periodical that began in 1987, as a forum of ideas, committed to freedom of expression. As a volunteer-based alternative media, Dialogue features articles written and suggested by its readers across Canada and beyond. Previously published from Quebec and Ontario, Dialogue magazine (since 2001) is compiled from the home of its publisher, Maurice King, and its editor, Janet Hicks King, in Nanaimo, on Vancouver Island, BC. Our goal is for this website to provide an interactive resource to support and enhance the communication and empowerment mission of Dialogue magazine. There are many inspiring and informative sites on the Internet and our goal is to develop our web location as a home that brings together all the perspectives that 'truth-seeking troublemakers'* and creative activists might need or want to know – or want others to know - ideas that are important for moving us in the directions we want to go! Through the original articles and referenced material and links on the site, we hope to encourage: critical thinking, deep understanding, ‘radical imagination,’ heart-centered consciousness, creative activism and effective local strategies ~ and a sense of humour to see us through difficult times! If you are a Dialogue columnist or writer, please email a biographical note and photo or favourite image, so we can build the page that will feature your contributions. Thanks! While under development, this website is being hosted as dialogue2.ca - and the original site, www.dialogue.ca, now links to this site. Thank you for your patience – and even more, for your help – while we build and develop a new interactive website for Dialogue magazine. We hope you will join us in this exciting adventure by forwarding your suggestions, input or images. You can add & view events at the Current Events page.